It’ll come back, I promise. Toxic gases and oozing lava have turned the once vibrant forests on the eastern flank of Kilauea into a wasteland. The destruction may get even worse, with the risk rising for an explosive eruption as the lava lake at the top of the volcano drops. But it’s never too early to start talking about what comes after things inevitability quiet down. Specifically, let’s talk about what will happen in areas where lava flows and fire fountains have transformed the landscape. 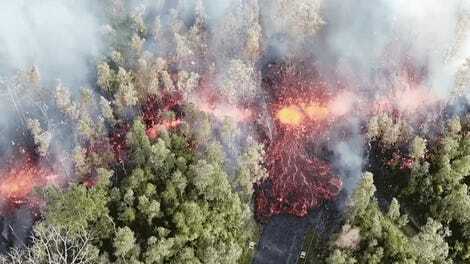 The surface of the lava flows are already hardening into place, taking a shape that could last for thousands of years, assuming they aren’t overwritten by fresh lava from new eruptions. 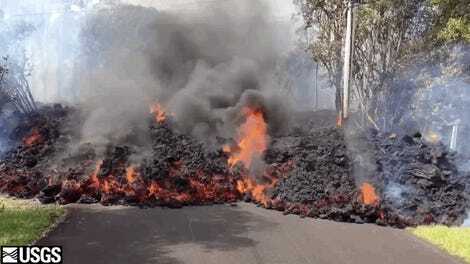 “In an area with lots of rain, the surface of the flows will cool more quickly,” Benjamin Edwards, a volcanologist at Dickinson College, told Earther in an email. Rain showers are in the forecast this week, which could speed the cooling process, but Hawaii’s traditional wet season is winter, so there’s not likely to be a lot of pluvial assistance in the coming weeks. But while the surface firms up, the flows will continue to emit lots of heat. “Even flows that are days to weeks old are hot enough that plastic will melt if it sits on the flows for too long,” Edwards said. So yeah, it’s not exactly going to be a hospitable habitat anytime soon. But life finds a way. 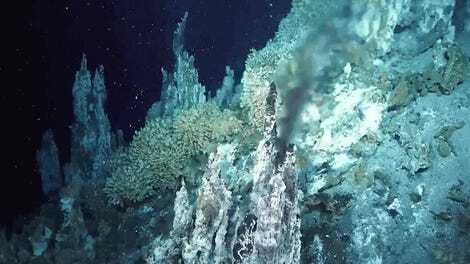 The good news is, all the iron and phosphorus that the lava drags up from inside the Earth is plant food. And when the rainy season does hit, the precipitation will start weathering the rocks and leaching some of those minerals. The eruption is on the rainy side of the island, which could speed along the process. Wind will help spread seeds and spores and from there, nature will do its thing. Edwards noted that a study of plant succession at Mauna Loa, which sits just to the west of Kilauea, provides some clues of what may come back first. The findings use an analysis done in 1989 of plants at the sites of five eruptions that took place between 1852 and 1984. The 1984 site showed that just five years removed from an eruption, lichens and moss covered three-quarters of the lava. An ʻohiʻa lehua tree colonizing a lava flow. At the site of a 1942 eruption, plant life was much more abundant, and even included some trees and shrubs. And looking at the site of the 1852 eruption showed that in 137 years, the signs of the eruption were nearly gone, with no exposed lava at all. ʻOhiʻa lehua, a flowering evergreen tree that’s abundant in Hawaii, is one of the first trees to colonize lava. And because it grows at a wide range of elevations, it’s one of the trees likely to come back first at Kilauea. Animals will also slowly find their way back, with insects likely to lead the colonizing charge. The National Park Service notes that most of Hawaii’s native species are descendants of birds, bats and other things that flew to the islands. Larger animals will likely fly back to the lava flows once there’s enough food and shelter. But there’s another important life form to consider: humans. 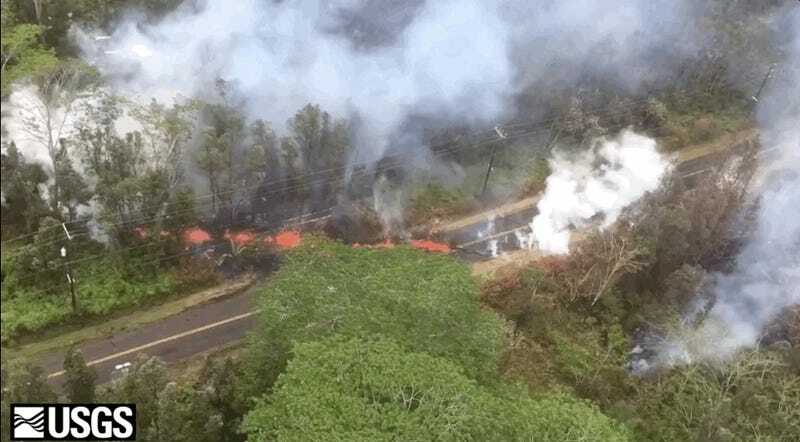 At least 36 homes have been destroyed in the eruption and entire neighborhoods have been evacuated. After an eruption of this magnitude, you’d think moving back would be a risky choice many would not take. You would be wrong, though. The front yards still leave a bit to be desired, though.